Anxiety is an emotion, not a character defect. People with the greatest need to control their lives are often hit hardest by anxiety symptoms. Those who experience high anxiety levels tend to be high-functioning, high achieving, strong individuals who exercise a lot of influence over their lives, yet can’t understand when things go wrong. For me, anxiety is a big clue that something in my life is out of balance – whether my mind is too future-oriented, my desire for control too amplified, or my sense of my own power too unappreciated. 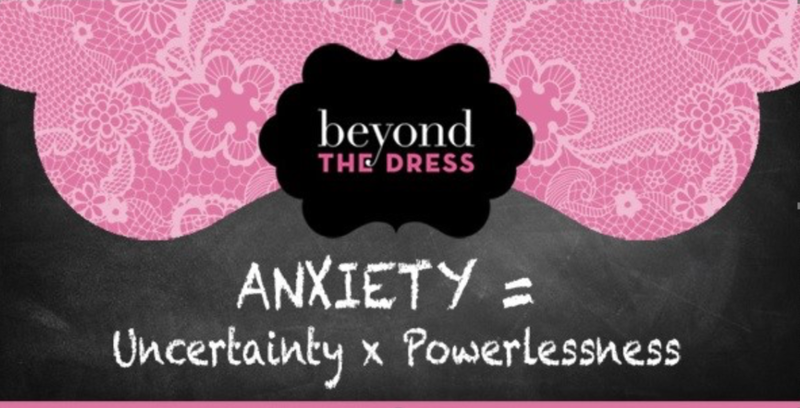 Anxiety is not an equilibrium condition; it’s not what we should strive for. But we can welcome it into our lives and then ask ourselves what we need to do to reduce our uncertainty or feeling of powerlessness. When anxiety strikes, create a balance sheet of what you know and what is within your influence. Unravel the sense of mystery about what you don’t know. Anxiety lurks in the dark, so shine a flashlight on what it is that’s disturbing you. Is this situation as uncertain as you think it is? Are you overestimating the danger associated with this mystery or the importance of the event? Then explore whether you are truly ill equipped to address the experience. If you are, what resources can you tap into to help you feel a little more powerful? Make a list of your strengths, your coping skills, and the resources available to you. Sometimes the best solution is just to focus on what you can control; that may be as simple as your breathing. Create four columns on a piece of paper. Label the first column “What I know” and the column next to it “What I don’t know.” Label the third column “What I can influence” and the final one “What I can’t control.” Then fill in the columns. In the process of making these factors explicit, people are often surprised by how much certainty and influence they actually have. There are some things in life that are worth worrying about, and there are others you just need to let go. My best advice is to focus on what you do know and can influence: your body and your mind. Reduce your caffeine, sugar, and alcohol intake, and eat foods that provide you with healthy fuel. Physical exercise is one of nature’s remedies for stress, and getting plenty of bed rest allows your body to rejuvenate itself. Kevin Cashman, the CEO of LeaderSource, says that typically, before any great mental breakthrough, there needs to be a “pause-through” when you let your body and subconscious take over from your conscious mind. When the world is uncertain and overwhelming, breathe, and miraculously, you may find that your mind moves from a war zone to a refuge. Here’s to letting go of what you can’t control.